The roleplaying game experts at Square Enix and puzzle game kings at PopCap give the puzzle RPG genre a Bejeweled Twist with Gyromancer. Is it as addictive as it sounds? It sounds like a jewel-matching RPG made in heaven. Players taken on the role of Rivel, a summoner traveling through the Aldemona Wood who becomes embroiled in an evil plot that could change the face of the world forever. 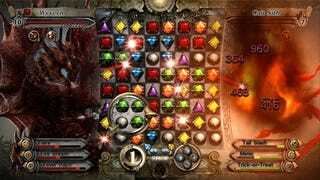 Instead of charging into battle himself, Rivel takes on the creatures of the woods by summoning mythical beasts to fight in his stead in battles that combine the gameplay of Bejeweled Twist with hit point meters and damaging special abilities. Did the combined effort of two developers are at the top of their games result in a stronger whole, or does all of that spinning throw Gyromancer off-balance? Spinning Your Fate: Gyromancer's core game mechanic is a highly satisfying melding of Bejeweled Twist's gameplay with RPG conventions such as hit points and special powers. You choose one of three monsters in your party, each with a color affinity that has strength and weaknesses depending on the color of the monster you are fighting. Both creatures have a number of powers that activate via gauges that steadily fill with each turn of the focus wheel. Making a match with your creature's colors speeds up power activation, while matching your opponent's colors halts the progress of their gauge. Activating a power places special gems on the game board that must be matched to set off damaging effects. It starts off simply enough, ramping up as new creatures with new abilities join the fray. Soon a penalty is applied for twists that don't result in a match, ramping up the pressure significantly by lowering the amount of time it takes for your opponent's spells to go off. It's all timed well enough that once this limitation is imposed you're already thinking ahead to ensure you've got a match lined up. While luck does play a role in Gyromancer, pulling off a big win still takes a certain amount of skill. There are few feelings as satisfying as taking out a powerful foe with a creature that started the round on its last sliver of health. It's a feeling of accomplishment that can be quite intoxicating. Gotta Catch Em' All: While the puzzle battles are the main draw of Gyromancer, you're only as good as the monsters you collect. Throughout the game you'll discover new, color-coded creatures to add to your collection, spending points earned in battle to upgrade them to their more evolved forms. You can only take three creatures into battle at a time, and with color affinities weakening or strengthening your pets depending on the foes they face, knowing which three to take into which level is a key element of the game's strategy. While initially it seems as if the only difference between creatures is hit points and color, you'll soon discover differences in powers and behaviors that will have you mulling over your lineup for minutes at a time, trying to form a winning team. Some creatures offer greater power at a price, such as one gnat that locks pieces in place on a regular basis, making it difficult to activate the strong magic it possesses, while others carry a wealth of hit points but are slow to accumulate the power necessary to damage enemies. You'll develop favorites, and certain enemies will make you groan when their portrait appears on the versus screen. That kind of involvement and recognition is the hallmark of a good game, especially in this genre. Spinning Around And Around: While battles in Gyromancer are involving and satisfying and the odd challenge levels you'll encounter will test your skills, there really isn't all that much to the game. It's an endless string of battles without any of the extra activities like spell research, crafting, and mount leveling that made Puzzle Quest: Challenge of the Warlords so very addictive. Despite obvious influence from both both developers, Gyromancer comes across as more of a PopCap game than a Square Enix title. There's a heavy emphasis on the puzzle aspect of the game, while the roleplaying elements are limited to gaining levels and just a hint of exploration and problem-solving. What's missing is the depth that Square Enix normally brings to its RPG titles. There are no side quests or mini-games here; just 15-20 hours worth of fights with a little story drizzled over top. Gyromancer will certainly satisfy a puzzle gamer and might even win over the odd Pokemon player, but RPG fans lured in by the Square Enix name will find themselves somewhat puzzled. Gyromancer was developed by Square Enix and PopCap Games and published by Square Enix for Xbox Live Arcade and Windows PC on November 18th, 2009. Retails for 1200 Microsoft Points or $15. A copy of the game was procured via Steam for reviewing purposes. Completed PC version of the game's main story and dabbled a bit in the additional content.